This fluffy asparagus quiche is speckled with feta and perfect for your next breakfast or brunch. As for the homemade crust? It’s the easiest you’ll ever make! You totally already knew this was coming right? I’m on a little bit of quiche kick lately. National egg day is on June 3rd… and I’m simply getting a head start. This has absolutely noooothing to do with the fact that I have been pining over the darn things day and night. I’m simply being practical. I could come up with a lengthy intro to this post or tell you a story about Pau’s crazy cat and how she ate all the lasagna again like she’s freaking Garfield… but let’s just skip the semantics and get right on down to brunch. This easy peasy asparagus quiche recipe makes 4 mini quiche or one large quiche, perfect for slicing and sharing! The leftovers are equally great the next morning as an easy peasy heat and eat breakfast. Enjoy! 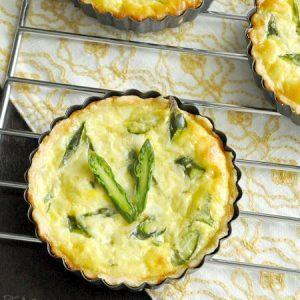 This fluffy asparagus quiche is speckled with feta and perfect for your next breakfast or brunch. As for the homemade crust? It's the easiest you'll ever make! Yields 4 mini quiche or one 9-inch quiche at 4-8 servings. First make the crust by mixing the flour and salt with fork. In a separate bowl, beat the oil and water with a whisk or fork to thicken. Divide dough into 4 equal parts and press each flat on a solid surface. You'll want to press the dough super thin so it comes out flaky and magical. Next start on your asparagus. Trim the ends and blanch in a thin layer of boiling water for about a minute or so, just long enough to turn the stalks bright green and tender. Immediately plunge the spears in an ice bath or rinse with super cold water to halt the cooking process [no soggy spears here!] Slice the spears into thin diagonal cuts... or pretty much any way you feel like slicing them! Just not super thick. Add a little salt ad pepper to taste. Crumble a little feta on top and serve. If you're feeling feisty, top with a drizzle hot sauce and a barley-there sprinkle of red pepper flakes for an early morning pick-me-up... aka a mondo kick in the tastebuds=) You know you love it! No asparagus? No problem! Try it with broccoli or spinach if your veggie choices are limited. 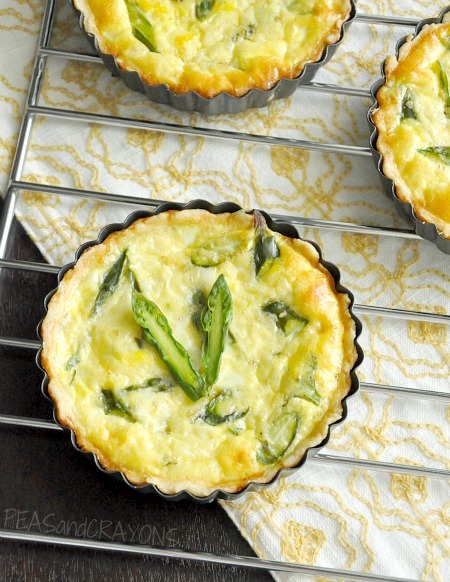 If you get a chance to try this fluffy asparagus quiche recipe, let me know! You can leave me a comment here (LOVE checking those daily!) or tag @PEASandCRAYONS on Instagram so I can happy dance over your creations. I can’t wait to see what you whip up! Cheesy Roasted Potato Breakfast Bake – Helloooo comfort food! Healthy Homemade Granola Recipe <– great with yogurt and fruit! Perfect for a summer lunch. I like how these are individual-sized, too. Yum! I love quiche and I especially love asparagus and feta. This looks delicious! I freaking love your quiche! Never would have thought to put “fluffy” and “asparagus” in same sentence – but you do both the quiche and the stalks justice! This is grand! BEAUTIFUL photos my love! And this looks delic! I swear it’s been quiche week! I love the asparagus stalks baked into the top! my birthday is june 3, and i get egg day. EP’s birthday is december 4, and he gets cookie day?!?? what kinda crap is that? hahaha. i guess i’ll go start preparations for my birthday eggs. yummy! i love quiche too! great way to get rid of on the border things that need to be eaten… throw it all in some egg mixture and eat away. Too hilarious – I missed that last sentence on your post and was about to sit down and write: “There are never too many quiche posts – I freaking love quiche!”. Haha then I saw your last sentence – great minds and all that…but still, I freaking love quiche! This looks great!! Love asparagus, I don’t think I have ever had it in a quiche though. Lovely! This looks perfect, so light and fluffy – and asparagus and feta are two of my FAVOURITE ingredients! Gorgeous photos! How can anyone not love quiche?! Theres something wrong with me. Ive NEVER had quiche before, but I ADORE eggs. What the heck?! This looks awesome lady! Wonderful appearance! The split asparagus spear garnish is quite attractive and the golden brown crust signals that this was perfectly baked. Brava! They are uber affordable at Bed Bath and Beyond with one of their coupons and are so small that you can stack them and then tuck them into an existing baking dish or bowl. I just nest them inside of something bigger until its time to whip them out and quiche them up! <3 Dooo it! I freaking love that you gave me a new reason to use my little tart pans! I am Totally in love with this easy recipe. I think June 3 is going to be the best Holiday ever. Also, the boychild ate a gajillion balls. sriracha WILL be dolloped on top of this quiche. Love the garnish. I really enjoy having full mini sized version of things. Where do you keep all of the extra tins. That is the one thing that holds me back…no storage. I’m just a little bit hungry after reading this. Bookmarked and #nomnomnom ready to eat haha! i freaking love quiche too!!! yay! this one looks particularly wonderful! thanks for sharing! These quiches look WONDERFUL!!!!! Quiche is one of my favorite things to make and this just looks soooo good! Anything with asparagus and feta is a win!